How can we build a stronger workforce for Iowa’s future? There is a HUGE disparity between what parents can afford to pay for child care and what it costs to provide high-quality child care. Stabilize the child care provider market. 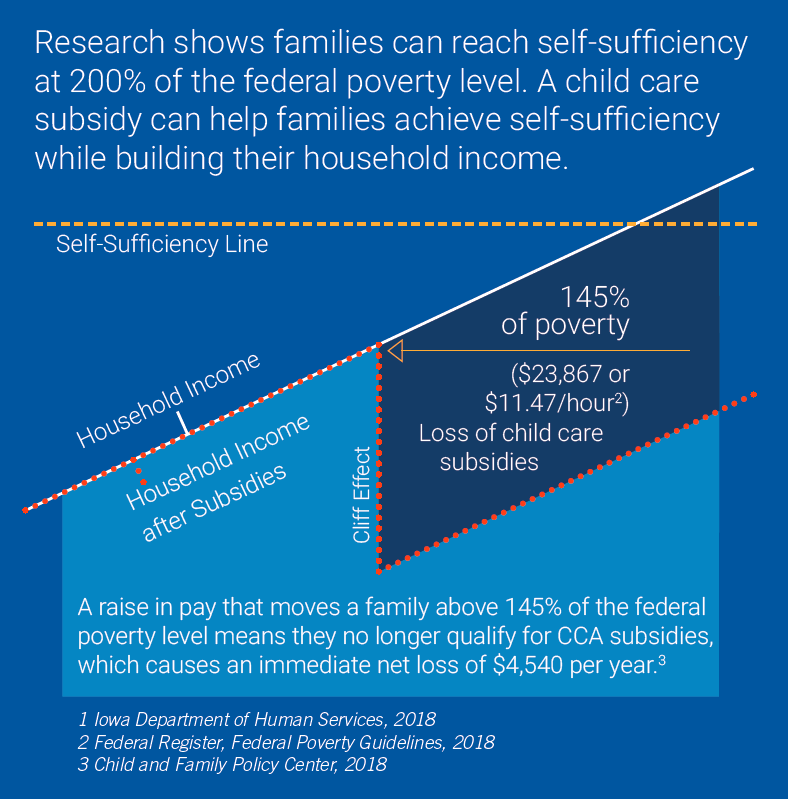 If families can maintain Child Care Assistance while earning more, they are more likely to achieve financial self-sufficiency. 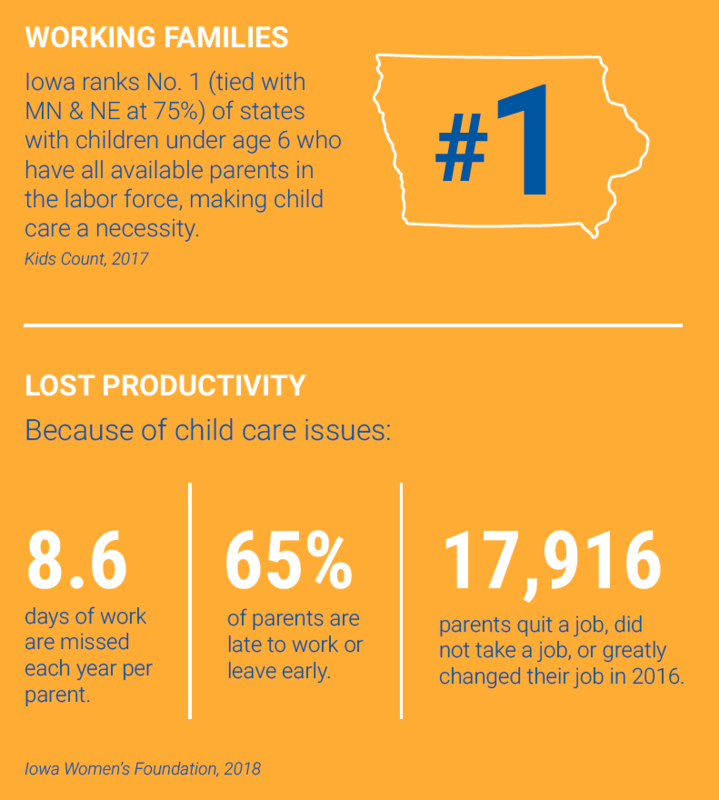 94.7% of parents receiving Child Care Assistance are working, but a raise of just 15 cents an hour could put them in jeapordy. The top cost per month for an Iowa family of four (2 adults, 1 infant ,and one preschooler) is child care ($1,035), followed by health care ($800), and housing ($659). The average annual cost for an infant at a licensed child care center is $10,131, compared with $8,767 for tuition at an in-state public university. If families had affordable, quality child care, employers could retain and attract talent. 65.1% of women with young children are working. Parents who have changing work schedules or work hours outside of Monday-Friday, 8:00 a.m.-5:00 p.m. have the greatest difficulty finding child care. 48% is the decrease in the number of programs accepting Child Care Assistance since 2012. 85% of job applicants wish their employer offered child care benefits. Eliminating the cliff effect is a priority of the Opportunity Plan. Over the past year, community members have come together to develop and refine the Central Iowa OpportUNITY Community Plan to take action against poverty in central Iowa. The plan's goal is to have a realistic game plan of actions, big and small, that can bring financial stability and prosperity to the one-third of central Iowans who live in or near poverty.